Health o meter’s Professional Electronic Chair Scale Model 2595KL uses highly sophisticated microprocessor technology. Each precision instrument is designed to provide accurate, reliable and repeatable weight measurements and features that make the weighing process simple, fast and convenient. weight of a moving patient. The weight can be display in pounds or in kilograms. The scale includes a seat with arm supports that fold up for easy entry/exit. Also included in the scale are two large wheels and a handrail for easy mobility. The unit can be operated using its AC adapter or by 6-C cell batteries. The Health-O-Meter® Model 2595KL* is a heavy duty 600 pound/270 Kg capacity digital electronic chair scale from the Health-O-Meter® family of bariatric scales. Ideal for clinical office, hospital or weight loss center use, the Model 2595KL features a highly accurate electronic weighing mechanism for years of reliable measurements. 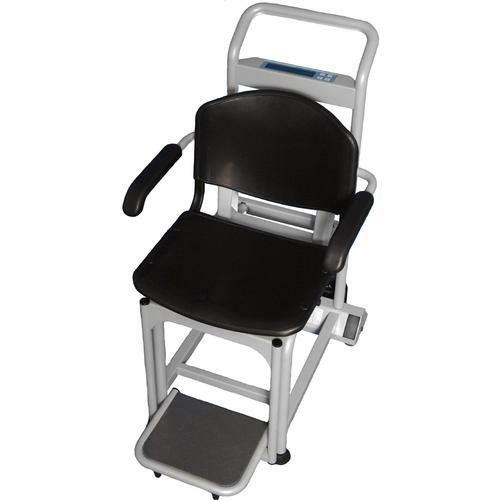 This is a full capability, high capacity bariatric scale with a comfortable seat to make it easy to weigh large or infirm patients while they are seated. The scales chair based design makes it ideal for patients who are unable to stand comfortably on a platform scale. This scale is built to industrial specifications for years of reliable use. Easy to read - the scale features a display/keypad module with 1" LCD digits, ON/OFF and lb/Kg controls. The scale also has a reweigh function. The keypad and controls are mounted to the back of the chair frame for easy access. High accuracy - the all solid state electronic measuring system has auto-zero self calibration for accurate weighing up to 600 pounds/270 Kg in increments of 0.2 pound/100 g. If you want a similar performing platform . Large seat - the 15 1/2” x 18 1/4” x 16 1/2“ weighing seat is padded, the chair armrests are movable and the scale footrest folds up making it easy to accommodate patients. All steel construction - the scale frame and enclosure are all made from high grade steel and stainless steel for high strength and long life. Dual mode - the scale switches between pound and kilogram mode at the push of a button on the control module. Flexible power - the scale includes an AC adapter or will operate for thousands of weighings on one set of six C batteries (not included). Automatic shut off for long battery life. Low battery indicator. Easy to move - the scale has built in locking castors to make it easy to roll the scale from room to room. Warranty - Two year limited warranty. This is a very high capacity bariatric scale that represents a very cost effective state of the art clinical weighing solution. Built for long term, high volume use, it provides an ideal solution for clinics and hospitals who need to add high reliability, high capacity weighing capability and convenience for their larger ambulatory and wheelchair transported patients.